With a sentiment for the sound of Disco and Deep House, Mario Basanov rose to popularity alongside his production partner, Vidmantas Cepkauskas (Vidis), with acclaimed underground hits such as I'll Be Gone, Who's Shot the Silence and Changed. The duo's subsequent album, alongside various solo releases and remixes, led Basanov to universal plaudits and a Producer of the Year award in his home country of Lithuania. With his reputation as a DJ and producer forever increasing, Basanov now spreads his wings further still with the release of a debut solo album, Journey. Breaking through Dance music's self-imposed boundaries, its 16 cuts demonstrate a genre-defying versatility that points towards an even brighter future. Are you proud to be one of the few well-known producers from Lithuania? "Yes, extremely. Although I don't forget that there are better producers than me, not only in Lithuania, but all over the world. How did your interest in DJing develop? "Previously, I was only making music. However, after working with Vidis I felt the need to promote my own music to the world - not only through the records, but through live performances as well. It was Vidis that suggested I try DJing. I liked the idea and after practicing at home I moved to the dancefloor. Currently, I spend most of my time playing DJ sets all around the world. It gives me new thoughts and fresh ideas, which are later transformed into music. The audience inspires me and allows me to experience sensations that lead to new ideas and creativity. " Do you use vinyl, or are you 100% digital now? "Right now I play only with CDs, even though at home I have turntables. I also collect records as they have far more lasting value than CDs. When travelling it is just more convenient for me to carry a CD case or USB with stored music. Not all music is released on vinyl, so I have to use CDs anyway." "I give a lot of energy to everything I do, and take my work very seriously. Therefore, I believe that the quality of my music will be always valued"
Do you try to slip your own music into the set? "Of course! I love seeing how people react to my music! I often play unreleased tracks so that I can improve them later in the studio. I hear how these tracks affect the crowd and I pay attention to the technical nuances as well. You can often discover from the dancefloor what should be improved from the technical side in order to get the best sound quality and technical performance." What mood do you create with your DJ sets? Do you react to the audience, or is it more pre-planned? "My moods are very different when I DJ and mostly depend on the crowd and the venue I play at. I also take into account the country and its market. I try not to become too accommodating; although to each audience I give my version of what I think they believe is trendy and makes them move. Sometimes I try to prepare for my sets in advance. I put down a playlist in my mind, but the reaction of the audience usually leads me to change the process. I can't remain indifferent to the crowd's reaction, because I play for them and my task is to fascinate those who come to see me DJ." What have been your favourite locations to DJ? "I really enjoy playing in Berlin, because the audience understands good music. I also loved playing in Brazil. I can't single out certain locations as it depends on many things. I enjoy playing where people come to listen to what you do on stage, instead of having an indifferent attitude." How did you get involved with producer Vidmantas Cepkauskas? "When I was working as a producer, my friends suggested that I should collaborate with Vidis. He was also looking for somebody who might help him to make music. We started right away, it was all quite spontaneous. After meeting and working together at the studio we soon realised that we complemented each other. We are constantly looking for new solutions and ideas to implement into the music." You collaborated together on the album Changed, were you surprised by its underground success? "I demand a lot from myself. Even though I cannot predict success or failure, as a producer I want to be listened to and understood. I give a lot of energy to everything I do, and take my work very seriously. Therefore, I believe that the quality of my music will be always valued." Can you tell us about the concept or inspiration behind your debut solo album, Journey? "For 15 years I produced music, but only recently did I feel ready to release a solo album. The ideas were collected one after the other until the time came when I felt ready to present a serious product to the world. The album title is not accidental - it is like the soundtrack to my life. The musical arrangements are the real journey; some tracks have already been released and are well known to listeners, but on this album they have a new colour. Other tracks were made specifically for the album. Journey has its own start, prelude and a separate end and is available on vinyl for DJs as it contains extended versions. Without doubt there will be a digital version too." For a Dance record, the album features quite an eclectic range of songs, was that the plan? "Part of the idea was for the album tracks to be very different in nature. Maybe it was not always deliberate, but it certainly went in that direction. I was not trying to unify it. On the contrary, I wanted to create more colours and styles. I am very versatile, and was trying to reveal that versatility through the songs on the album. One half of the album is slow tempo and the other is fast." What can you tell us about the featured vocalists? "The vocals certainly provided more soulful colours. All vocalists who were recorded for the songs are wonderful with different personalities and vocal styles. Surprisingly, every time I was making an instrumental version of a track I received invitations from another vocalist to produce the track together.n such cases, I was sending them instrumental versions and continued to work on the track after the vocals were recorded; together with their vocal parts they were bringing new ideas for the arrangements to the table. "On Journey we have vocal contributions from Miss Bee, Minalga, Edwin Williamson, Athena Radford, Stee Downes, Rahjwanti, and Jazzu. It's difficult to say why I chose one vocalist over another on certain tracks; I think it had something to do with musical intuition." Is the lyrical content left to the vocalist, or do you like to guide them into a theme? "Completely, I gave total freedom to which ever vocalist I happened to be working with. Only by having total freedom to write their lyrics can a vocalist sing with feeling, emotion and meaning, and impart that with their voice to allow the listener to fully perceive their capabilities as a vocalist and the emotions they choose to express on the track." Were the vocals recorded in your studio, or were they sent electronically to you? "Most of the vocalists were sending me recorded vocals and we later discussed what needed to be revised and rewritten. Some of them, like Jazzu, Minalga and Edwin Williamson, had the possibility to come to my studio where we could work together. If I could, I think I would rather participate in the ocal recording of each singer, but these circumstances are not always possible. Vocal recording is very important and I often tell vocalists what kind of melodic twists and style I want." Do you work on the music at a home studio? "My studio is separate from my home. I don't want to take my studio work back home because I believe I will never have time for a personal life. At the moment I have expanded my studio. I have lots of new machines that need space. Acoustics are also very important, and I would probably fail to implement that at home. It's nice to have an independent workplace and I often grab new ideas while travelling to the studio." I know you like to use a lot of synth hardware, what are your favourites? "I have a vast array of synthesizers, both soft and hardware. Some of my favourites include the Dave Smith Prophet '08; I think its sound is very well suited to Disco music. It has very good bass and especially good brass synth sounds, which is exactly what you need for Nu-Disco. I also have a Moog Voyager - a super analogue mono synth. It has fantastic lead and bass timbres. The Vermona MARS has a really weird and original sound and an easy to use editor. It's good that it's not very popular, so the sound is always original. The Waldorf Pulse and Microwave are my latest purchases, and I really did not expect I would use them so much! The last four tracks on my album are produced almost exclusively with these machines. "My current favourite is the ARP Odyssey; you can't confuse it with other synthesizers. Maybe it's not used everywhere, but the sound seems to be extremely widespread. And finally, my good old Soviet synthesizers: the Aelita and Polyvox. Of course they're not German quality, but they still sound really interesting. Occasionally I use those strange, noisy sounds they produce." "The most popular software stuff I like to use is FXpansion's DCAM: Synth Squad. I like to really explore this one. It is one of the things that, without exception, I can always end up finding great arp and bass sounds in, and it has a very user-friendly editor. Sylenth is already such a soft synth classic, too. You can find everything you want in there, from good pad leads to percussion." Tell me about your production - what editing toolsare you using at the moment? 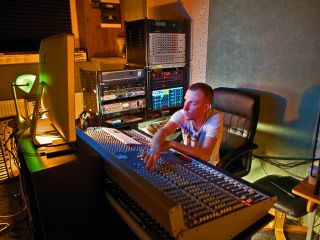 "I produce my music with Cubase 6.5 and have been using Steinberg's products for about the best part of 15 years. In this time I have created lots of handy shortcuts that I use, so I am really fast while making music with this software. Overall I think that the best programmes to make music with are Cubase and Logic. I would also say that Ableton Live is extremely convenient to use, but when it comes to pure sound quality, it falls behind. So I do not plan to change to using any other programmes for my main production work at the moment. I'd also say that, without exception, my mixing and mastering is done using an Avalon VT-747SP tube compressor and TC Electronic's Finalizer 96K. I think that they just have a great sound to them." What about monitors? Are they customed to fit your environment, or is it more a case of allowing your ears to adjust to them? "Currently I use Quested S7 speakers for monitoring, which are just perfect. I think they are the best out there. The rest I leave to what is given to man by nature - my ears. Technique is not as perfect as the human ear, which always tells you exactly how much you need, what you need, and when you need it. My musical intuition, along with my hearing, rarely disappoints me." Do you collect and use a lot of plug-ins? "Yes, I use Wave plug-ins a lot. They help to process the sounds that I have really well. Of course, the aforementioned FXpansion's Synth Squad is great. It has four synths and two of them have great data banks of arps. It gives me a lot of opportunity to pull out nice timbres, and I can create some very special sounds with those. I would say that I'm not a physicist; I'm a musician. I can't explain everything in numbers, but I strongly recommend testing these plug-ins as they are fantastic!" Do the ideas come quickly to you? "Sometimes it seems that I am the idea myself, so I do not need to stick with a new idea for too long. The most important thing for me is to catch the right mood and then let the work run free. Often I can make a track through the night, but the next daywhen listening back to it with a fresh mind I need to make corrections. Sometimes after I hear a song or melody, I already know what my next track will be. Somehow my senses are aroused, and that helps the music flow much more freely." "The sound of the Prophet '08 is very suited to Disco music. It has very good bass and especially good brass sounds"
How do you go about sourcing sounds for the album? Do you work with custom sounds to begin with, or collect a library of sounds over a period of time with the intention of using them? "Sounds appear in the same way as ideas. Every mood or thought needs a separate sound that is able to convey it. So while making music, I like to look for colours and timbres that together create the process of making music. Every sound is individual. Sometimes while hearing a certain timbre I know what melodic lines I could use it for, the style, and how they can tie in with other sounds and their order of importance. Of course, over the many years I have collected a considerable library of sounds, so I often use sounds I already have. I prefer analogue sounds as it's highly important that the sounds I use are as real-sounding as possible - it gives the music a sense of certainty and completeness." Do you EQ as you go along? How much of that is left to the mixing process? "I always mix the track while making the music - that way I can hear everything as a whole and decide whether it has the right musical timbres and sounds or if it is lacking in something. I master the tracks at the end, which is where I put my amp compressors to work. Right now, everything is mixed in the box." What is your most essential piece of studio equipment right now? "My Avalon VT-747SP tube compressor. I am doing my mastering with Avalon right now. What I really like about it is that it has this warm colour to it. It also has an amazing EQ that helps me when mastering, especially when I'm dealing with higher frequencies. I want to keep my Avalon for mixing and I soon be mastering with a Tube-Tech LCA 2A, which is arriving shortly. Working with this hardware you get the quality you need, and the harmonics to expand the sound. For example, when playing the piano, all the notes vibrate; it's called overtones. It's the same with hardware; you get lots of extrinsic sounds that expand the overall harmonics of your music." What equipment would you like to add to the studio? "A Buchla or ARP 2600. Buchla is my dream, but it's currently too expensive. The ARP is moderate in price and I really want to have it. I remember when I was working with a soft version of it; I could pull out lots of things, so it's not hard to imagine what I could do with the hardware. I'm also waiting for the arrival of a Korg Synthe-Bass, Korg Poly 800 and a customised 42-channel Soundcraft 600 mixer console that's been modified by a very famous Italian sound engineer! I want to change to Soundcraft 600 for audio mixing. I want to buy three RME Fireface 800 sound cards, link them and have 16 inputs and outputs - then connect them to the console and do mixing through it. "It would be nice, for example, to connect the mixer to a Studer Tape Machine. If I could combine everything, like analogue synths, tube compressors, analogue mixers and tape machines, I could extract some truly luxurious sounds, which is a rare thing in Dance music. There are a lot of artists with extremely poor sound. I don't think they care about how important it is. The leaders for me are people Metro Area, Owusu & Hannibal, Jazzanova and Todd Terje. I want to follow their example." What would you say is the most satisfying aspect of making music? "I think that creation is the most pleasing element. After all, making music is a way of life. I live for the process and it gives me the greatest pleasure. There is nothing more enjoyable than working in my studio all fired up with ideas that I can then turn into sounds. The final version is also important, but the creative process is much more important to me. When a track is completed it's given over to the audience, although during that time I'm already working on new tracks or remixes." What is your priority as an artist - to DJ, remix or focus on your own music? "Hard to say. I love what I do. I couldn't just be a DJ. I need to release my thoughts and turn them into sounds. However, it is extremely pleasing to watch the crowd and how they respond to my music. Remixes have their charm as well. I feel it is like giving the same person a new look, as if to dye his hair, change his haircut or dress him with some other set of clothes. "With remixes I have the opportunity to give new colour or mood to a track that has already been made. Nevertheless, I can put a tiny piece of myselfin there. It might sound strange, but I'd love to make a remix or just work with Kylie Minogue. She is not only a great singer, but I also love her attitude and understanding of music." "Technique is not as perfect as the human ear. My musical intuition, along with my hearing, rarely disappoints me"
Is DJing a financial requirement in the Dance music domain? Would you prefer to focus strictly on the music if you could make a living from that? "I love DJing, playing DJ sets give me new ideas for my work. It's not just for financial terms. It's extremely exciting making the crowd move on the dancefloor. I've never had another job, I've always worked at the studio. My clients were numerous Lithuanian music artists, but I am done with them and now focus only on my solo career as well as the Mario & Vidis project. Each weekend I play in Europe, Brazil, Mexico, Dubai and many other countries. I earn enough for a living and the development of my studio - this is the most important thing for me." How do you envisage your career developing - what's the perfect scenario? "I haven't thought about it. I do what I like to do and just want to do it further. Everything else is just the colours of life - and we need all kinds of them. Although I do have one career-related dream, I would love to make music for computer games. This is my passion, and I know that I could do it very well. I have made a soundtrack for one Lithuanian movie, which was a completely new experience. Music for movies has no limits. When you make Dance music it has its limitations and rules. Disco, House, Drum & Bass or Dubstep are all the same music, only with different rules. With movies you have complete freedom." So, you're a big games fan? "I've played games daily for 14 years, currently with my Xbox 360. Today there are plenty of good soundtracks for computer games like Assassin's Creed, Limbo, Machinarium, and my favourite, the very modern Mass Effect. These days, the gaming industry is more profitable than the movie industry. Some games cost twice as much as a movie. If people like Hans Zimmer can make soundtracks for Assassin's Creed and Call of Duty it shows how profitable it is. Making music for computer games is very interesting, as are the games themselves."